OK, what's with the thievery you ask? Some of you already know the story and call this your holy grail of sniffle fighters, others new to essential oils may not so here's the Cliff Notes version. Back in plague times many relied on herbal concoctions steeped in vinegar to stay alive. Soaking a piece of gauze with these fragrant vinegar's became the bases for vinaigrette lockets and royal healing bath soaks, both of which have made their appearances here on the site in the past (see here and here). Back then the lines between perfume, medicine and cosmetics were rather blurred. The Four Thieves themselves were allegedly former perfumers who doused themselves in essential oils before knocking off quarantined homes of wealthy plague victims. One recipe which was said to have been posted on the walls of Marseilles during the plague included meadowsweet, wild marjoram, sage, cloves,angelic, rosemary, horehound and three large measures of champhor (camphor) along with poisonous wormwood of absinthe fame. Interestingly enough many of these same ingredients, especially the camphor and cloves are found in our more modern Vick's Vapor Rub and Chinese Wild Tiger balms. The stuff works but what if you want to avoid the petrolatum, mineral oil and camphor found in many of the products sold in local pharmacies? 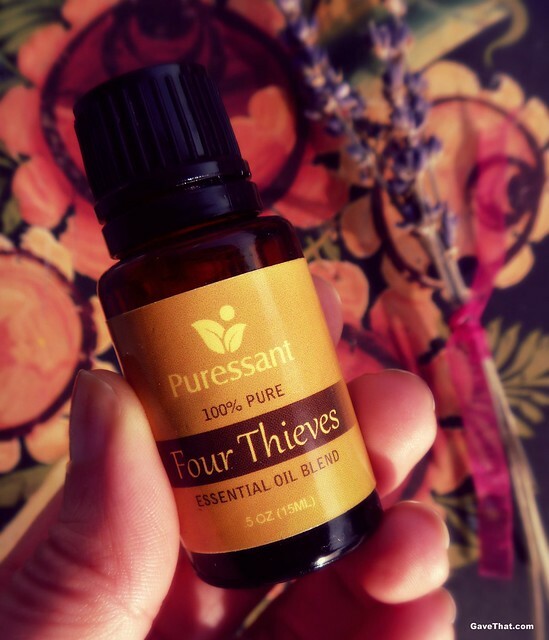 In Provence the French have been keeping the tradition of Four Thieves alive and now stateside it's become an essential oil blend with a cult following. I stumbled upon this one on Amazon and love it but this is seriously potent and should be treated accordingly. In addition to cloves there is lemon, rosemary, eucalyptus and cinnamon essential oils. That last one in particular is what can cause serious skin irritation if used neat and undiluted, so much so that I've noticed many stores have stopped selling it. 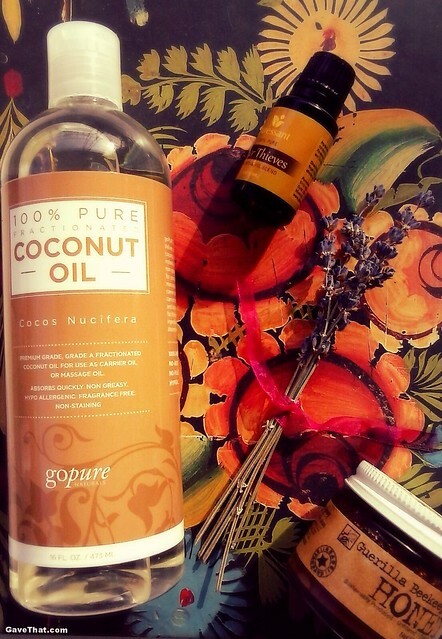 Two ways I've found that work great to dilute pure Four Thieves oil is either in 1.4 cup (or more) of carrier oil such as fractured coconut oil or in pure, raw organic honey. The best part of both of these carriers is the extremely long shelf lives sans preservatives these have. This Fractured Coconut Oil here by goPure for example feels the same as virgin coconut oil but never becomes cloudy or solidifies, is scentless and lasts five years or more without refrigeration. Honey acts much the same way fractured coconut oil does only it lasts even longer and has its own emolument and antibacterial qualities when in its raw form. If you've always wanted to try Manuka Honey for instance, a good DIY is to mix a single drop of Four Thieves and pure tea tree essential oil into organic raw honey. Australian Manuka is in the same family as both cloves and tea tree but the Manuka honey itself comes from bees which have fed on its flowers. It's also said to be ten times stronger than tea tree but I've been pretty impressed at how my DIY version has performed. You literally only need 2 or 3 drops of the Four Thieves to reap the benefits without jeopardizing your skin. Still it's a good idea to do a patch test first and to keep the applications to your feet or to something that is washed off. I put a few drops in liquid hand soap and it's been great. As for the scent, if you love Viktor & Rolf's Spice Bomb cologne than you should be okay with this clove heavy Four Thieves oil by Puressant. Different brands can have varying scents. Have you ever tried Four Thieves or essential oils for colds?